The verse above it one of Ernie's favourite verses. Why? Because he feels that this is his mandate. To equip the saints, to teach and train others for service. And he has done this most of his adult life. 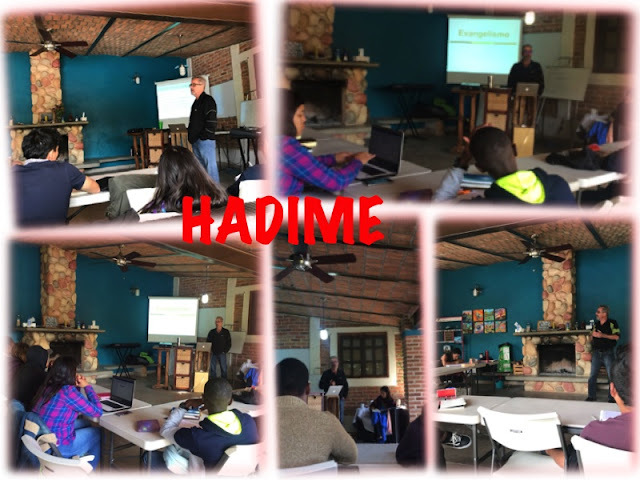 The picture above is Ernie teaching at HADIME. You are probably wondering what HADIME is? HADIME (click to go to their home page) is the Mennonite Bretherns' program here in Guadalajara for training in missions. Ernie has taught there before, and right now is doing it again. He loves this setting because it is mostly students from Latin America, which is loves. He is teaching some of his favourite material, Evangelism, Cross-Cultural Adaption, Contextualization, etc..
We, Ernie and I, plus those at HADIME, students and missionaries, Sandra Plett and Jen Schmidt, appreciate your prayers. For Ernie, as he teaches while not feeling 100% (allergies), Sandra and Jen as they run the program, and the students as they learn.